Elvis played by Charles Inojie and Lucky played by Bishop Imoh are two out of work hustlers who want make a movie. With the help of Prince (Ejike Asiegbu) who provides sponsorship they set about trying to make this happen. Prince, however is adamant that his favourite stars Mona Lisa Chinda and Ramsey Noah must feature for him to be involved. It becomes quickly apparent to the two that with the budget they are working with that it is going to be virtually impossible. Schola played by Uche Jombo works in a local pepper soup joint and dreams of becoming the next big thing. Elvis and Lucky decide that if they cannot afford Mona Lisa and Ramsey they will make them appear by force and use Schola to shoot the movie vigilante style. The way the movie started was disappointing. It didn’t feel like it was the beginning of a movie. You could have easily just been cutting into the middle of a movie, there was no difference. We see Schola and Elvis having a discussion. If I hadn’t read the back I wouldn’t have known what was going on. The sound was also too low and the the voices slightly muffled. That is not a good way to start a movie because it is these kind of things that can just make you switch off, nevertheless I had high hopes because it was an Emem Isong and Uche Jombo production and a much anticipated and hyped release. By the way who even told you that we are auditioning for ancestors? This was especially hilarious because Mona Lisa is known for speaking a bit like that when she is attempting to do an American accent. Everything I done give you since dey class 1-3… Plus recharge card wey I give u now now now give it back to me. Uche Jombo was brilliant in this movie. Her razness was stupendous and she really embodied the character and had the comedy down pat. In the first scenes I was really hearing the voice of Jenifa. Do you have strength in your waist to audition all of them, because I like some of them. I recommend this movie hesitantly, with all the hype surrounding it it is the kind of movie that people will watch regardless of what is said about it. I think that many people may find that the humour in the movie overrides the dull parts. I was surprised that I was unable to pay attention through a lot of this movie. Even when I have watched Emem Isong films in the past that I have not rated highly I can never say that I have ever been bored but in this instance there were a lot of those moments. The movie was funny in parts but mostly it just didn’t do it for me. The picture was mediocre and the sound was here and there, towards the end I kept hearing squeaking that was making me fell like I had a mouse infestation. I was even more so disappointed in this movie because there was a huge cast, major star appearances (wasted in my opinion), big name producers and an ordinarily great director and an original storyline and it just flopped. When I read about the movie before even watching it I was so excited. It seemed like excellent idea to make a satire on the movie making process in Nollywood and not something I’ve seen before so you can imagine how gutting it feels to have to write this. I can only conclude that although the general concept behind the story was good, the actual script and execution were just not tight enough. I just hope Emem BRINGS IT the next time. I'd love to hear what you think about the movie if you watch it… I was tempted to watch it again myself to make sure I didn't just imagine watching the whole thing. @aegol, i agree wth u. am kinda discoraged bt nevr d less will stl watch it. thnks nolly fr d review! Be sure to feed back! How come your name is linked to a no more debt collecting site? nolly..wat up boo..LOL. i knew u'd rate it like this…i also wrote about the poor production…and yes the boring parts were BOOORING…and the funny parts were funny…i really loved some of the quotes though…but i think many ppl might not like it esp after all the hype…the worst for me was just the fact that thru the whole movie i thought my copy was pirated…i think i probably loved the movie cuz i was tired of the whole john okafor and co type of comedy…but after i watched it agin with some friends..i realized it wasn't that good…plus emem needs to find a director/D.O.P that can use that HD camera better…her movies are always dark and gloomy. Benson or even Ikechukwu Onyeka.But I'll still luk out 4 it. I can tell you what was wrong with this movie…bad directing! It was a funny script with plenty of great actors but the director was either too intimidated or too involved in other things to know what to do with them. actors can not direct themselves…. if the sound, picture and etc was not up to scratch then it was poor directing…. i wish Lancelot had directed it! He would have made a better job of it in my own estimation. I so agree w/ you b/c the director can either break or make a film…even when there is an awesome script in hand. The director was too inexperienced to handle a cast of that magnitude! He goofed and spoiled a potentially brilliant film. The producers provide all you need… na the director to know how to bring out the best in those actors… unfortunately he failed to do it… shame! You are most probably correct. All I know is despite everything that marked this out to be great it just didn't work. I just dont get how this was released as the final product, sureley along the way there were signs that it wasn't working out at envisioned? You would assume with the all-star cast this film would be get a higher rating. I'll definitely go and see it just to see how they mix in filming here and aboard. And WOW at Monalisa's American Accent…this is a must-see. Did you notice that the Africa Channel's playing Nollywood films lately (re: once in a while)? You know I've not watdched The Africa Channel! 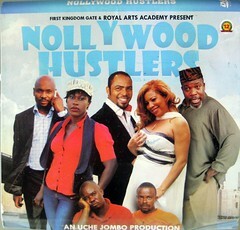 I definitely look forward to hearing your take on Nollywood Hustlers though! I liked some parts of Nollywood Nustlers and disliked some. I think the artists were not funny enough. I also think Nigeria may not be ready for that kind of comedy yet. For now, slap stick may still be the way to go. I am ready for any type of comedy but this one just wasn't good enough! Thats what I remember for the beginning of the movie, unless I am losing my mind. Mine was on VCD from Naija. I get what the movie was about totally. I think that the concept was a good one, I just don't think that it was executed very well and for me it was pretty boring for a comedy. No doubt it definitely had its moments, but far too few moments in my opinion. Disappionted is d word! I was looking forward to something else. Didn't get wat I expected. I was extremely disappointed in this movie. This is not the quality of production we are used to getting from Emem Isong. It was simply a waste of time. I had looked forward to watching it, seeing all the big names in the preview. I hope Emem never gets involved in this quality of work. Pls where can i download the film please !